I love using this frog print by Hoji for my comics. (Actually, it’s probably a toad now that I think about it.) Anyway… Enjoy this Old Pond Comic strip. Sometimes, too much editing = one-line haiku. (Old Pond Comics). “Does the red dawn delight you snail?” — A haiku by Kobayashi Issa illustrated by Old Pond Comics. The question “If your name was a haiku, what would it be?” is the writing prompt provided by Alan Summers today on the NaHaiWriMo Facebook page. Haiku masters live in the zenith, while the rest of us live in the pond. – Old Pond Comics. A pet crocodile is not a very good idea if you’re a frog, but they are so cute when they’re young. If you wonder how Kaeru got a pet crocodile, check out the Old Pond comic using the prompt “egg” written during NaHaiWriMo 2013. Sometimes, there’s only one way to finish a bad haiku. Learn Japanese with Old Pond Comics. We will start with basic greetings. “Ohayo Gozaimasu” (pronunciation: “Ohio” Go-za-i-mas ; the u is silent) means “Good Morning”. 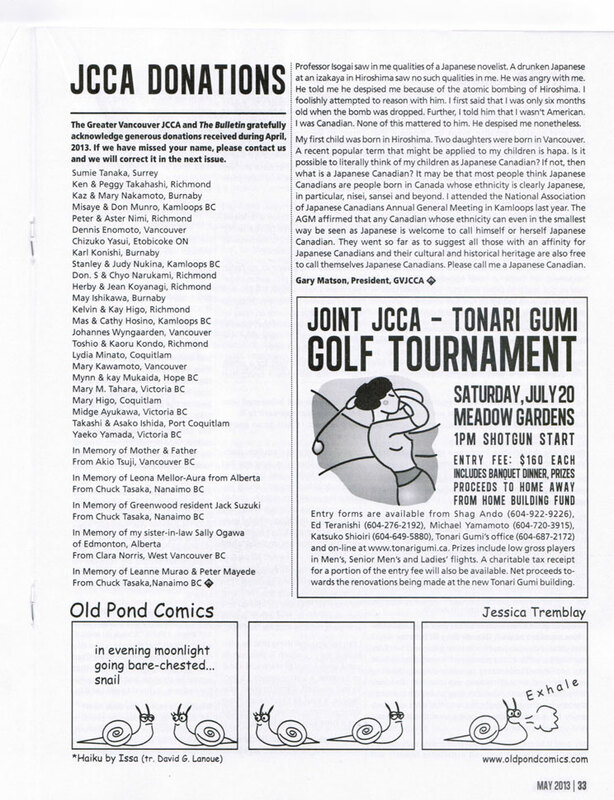 Second publication of Old Pond Comics in the May 2013 issue of The Bulletin: a journal of Japanese Canadian Community, history + culture.